Leadbelly "Live" New York 1947 - Austin Texas - 1949 DOCD-5676. This Document Records CD contains 21 tracks from 2 live performances from Leadbelly, the first 3 recorded on 6th September 1947 in New York and the other 18 tracks were recorded on June 15th 1949 and are known as `the Austin concert`. Leadbelly Private Party November 21st 1948 DOCD-5664. An extraordinary evening in the company of the great Texas songster, Leadbelly. In the relaxed atmosphere of an informal party the listener is given an up-close, dynamically interactive display by a master songster and storyteller, once a music companion to the legendary Blind Lemon Jefferson. Leadbelly: The Essential CBL-200003. Taken from the Document Catalogue, this double CD concentrates mainly on Leadbelly’s prowess as a blues musician. Leadbelly’s fast repertoire has all too often regarded simply as a stereotypical folk musician. In fact he was an all-rounder, also known as a Songster. Like Leadbelly his blues performances were intense and powerful his ability to play slide guitar, ragtime or low down blues, often on his thundering Stella twelve-string guitar ranks him among the best bluesmen from Texas, including his close friend Blind Lemon Jefferson. Leadbelly Volume 1 1934 - 1935 DOCD-5591. The remaining Leadbelly Arc and Library of Congress Recordings. These Leadbelly sessions were recorded from July 1934 to March 1935. Leadbelly Volume 2 1935 DOCD-5592. The remaining Leadbelly Arc and Library of Congress Recordings. The bulk of this Leadbelly session was recorded at Wilton, Connecticut in Febuary 1935. Leadbelly Volume 3 1935 DOCD-5593. The remaining Leadbelly Arc and Library of Congress Recordings. John and Alan Lomax encouraged Leadbelly during these recordings to perform not only the songs but also the stories behind them. Leadbelly Volume 4 1935 - 1938 DOCD-5594. The remaining Leadbelly Arc and Library of Congress Recordings. Leadbelly continued to record not only the songs in these sessions but he also put them into their context, creating spoken interludes about the background of the song, the events surrounding a song or his personal involvement in the song. Leadbelly Volume 5 1938 - 1942 DOCD-5595. The remaining Leadbelly Arc and Library of Congress Recordings. 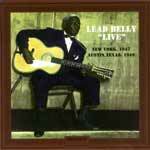 These Leadbelly sessions were recorded in Havers Studio, New York City (1938) and in Washington D.C. (1940 - 1942). Leadbelly Volume 1 1939 - 1940 DOCD-5226. The Leadbelly recordings on this Document Records CD represent a selection of songs that launched Leadbelly to the general record buying public. Leadbelly Volume 2 1940 - 1943 DOCD-5227. The selection of Leadbelly titles on this Document Records CD represents some of the sessions that have since made Leadbelly a popular success. Leadbelly Volume 4 1944 DOCD-5310. The Leadbelly tracks on this Document Records CD were recorded prior and during his stay on the west coast of the United States. Leadbelly Volume 5 1944 - 1946 DOCD-5311. The Leadbelly tracks on this Document Records CD come from the final years of Leadbelly`s career which include a live radio session with children and other contemporary artists such as Woody Guthrie, Sonny Terry, Cisco Houston, Brownie McGhee, Willie `The Lion` Smith and George `Pops` Foster. Leadbelly Volume 6 1947 DOCD-5568. Alot of the tracks on this Leadbelly Document Records CD are from an undiscovered session which surfaced fifty years after it`s recording. Leadbelly Volume 7 1947 - 1949 DOCD-5640. Within this body of recordings are numerous transcriptions of Leadbelly`s radio broadcasts as well as a good cross section of his songster repertoire. Leadbelly / Josh White 1937 DOCD-1018. This Document Records CD offers additional recordings by both Leadbelly and Josh White, in the form of newly discovered titles and alternative takes. A very brief Leadbelly Biog Leadbelly (January 29, 1885 - December 6, 1949) was an influential blues singer and guitarist. He was born Huddie William Ledbetter in Mooringsport, Louisiana, and died in New York. Leadbelly was a monumental figure in the history of US folk music. He was "discovered" by John and Alan Lomax, in prison in Louisiana, where he was recorded on portable recording equipment. It is claimed by Alan Lomax that he was pardoned by the state governor, O.K. Allen, after Allen heard his recordings, which supposedly included an appeal by song directed to him. Leadbelly subsequently toured extensively but ended up back in prison in 1939, convicted of assault. (He served four separate prison terms for his violent behaviour.) After this last prison term, Leadbelly moved to New York in 1940 and associated with Woody Guthrie and the young Pete Seeger among others. His best recordings were made for Capitol records in California during the mid 1940s. Leadbelly played a twelve string guitar and had a high clear voice. One of his best known songs "Goodnight Irene," recorded by many artists, was a number one hit for The Weavers in 1950. One of the more notable covers of his work in recent time was done by Nirvana in December 1993, when they played "Where Did You Sleep Last Night?" as the closer to their legendary appearance for the MTV Unplugged series, which was subsequently released as an album. It should be noted, though, that this song was not originally written by Leadbelly as Cobain had stated. Leadbelly died of amyotrophic lateral sclerosis. King of the 12 string. An article about Leadbelly by Paul E. Affeldt.